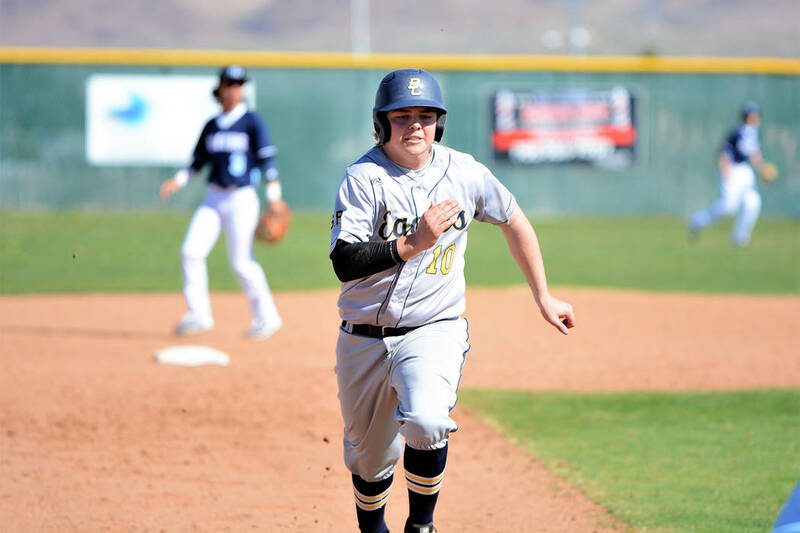 (Robert Vendettoli/Boulder City Review) Boulder City High School sophomore Blaze Trumble, seen running at full speed toward third base against Foothill on March 9, went 3 for 3 and batted in 4 runs during the Eagles' 16-1 victory over Chaparral on Friday, March 29. Defeating Chaparral 16-1 on Friday, March 29, and Sunrise Mountain 17-0 on Tuesday, April 2, the Eagles have continued their dominance heading into the second phase of the season. Defeating Chaparral in five innings, the Eagles collected 18 hits, highlighted by a 4 for 4 performances from senior Brendan Thorpe and a 3 for 3 performance from sophomore Blaze Trumble. Trumble finished the game with four runs batted in, while Thorpe finished with two RBIs. Sophomore Joey Giunta finished 2 for 3 with four RBIs and sophomore Troy Connell finished 2 for 3 with two RBIs. Defeating the Miners in three innings, Dunagan led the way with a monster performance, batting 1 for 2 with six RBIs and a home run. Trumble batted 2 for 2 with four RBIs and a home run and double. Connell batted 1 for 2 with an RBI. Dominant on the mound, Thorpe picked up the victory over Chaparral, throwing four innings where he struck out eight batters and allowed a run. Sophomore Scott Bahde won against Sunrise Mountain, throwing two innings where he struck out four batters. Looking to stay hot during a rivalry week, Boulder City will host Moapa Valley today, April 4, and Virgin Valley on Wednesday, April 10. They’ll also host 4A Bonanza on Monday, April 8, for a tune-up game.